Winter is a tough season. Dry skin, salt and rust on your car, and wear and tear on your roof are all common at this time of year. Even if you thought your roof was fine before winter started, you could be looking at problems when the snow and ice hit. Not to mention, a number of freezing and thawing cycles. These can wreak havoc on a roof that already needed a little attention. If you skipped the roof inspection this fall, here’s what to look out for if you’re concerned your roof needs repair. Water spots or leaks in your ceiling are obviously the biggest indicator something has gone wrong. Of course, unless someone in your family left the upstairs bathroom faucet running. If water drips are coming from your ceiling, or if it looks bowed or discolored, there is most likely a leak coming from the roof or in the dead of winter, ice damming or condensation in the attic. If you’re already seeing water spots on the ceiling, chances are it has seeped into the insulation and down into the drywall. It can be trickier to get at where the leak is actually coming from by yourself. Leaks can travel downward and not enter the house at the same point from where it originates outside. Call a professional roofing contractor to come look when in doubt. Missing shingles can be spotted from the ground sometimes. An ice and water shield can help keep your roof safe for a short time. However, missing shingles need replacing right away. We know you are not cleaning your gutters in the dead of winter. However, if you are starting to remember – “hey I saw a good amount of granules in the gutters this fall”, it’s time to call a roofer. Buckled, blistered or curled shingles can also be seen from the ground. While it may not be an immediate risk, it is always more likely that a leak will start from a weakness like this than not. You won’t be able to see cracked flashing from the ground. However, a contractor will, if the problem is bad enough to need a rooftop inspection in the middle of winter. The flashing – the material between masonry and roofing which keeps out leaks at the most vulnerable points – is very important. Cracked flashing can lead to leaks. While these aren’t necessarily signs you need a roof replacement, snow melting too quickly on your roof that appear as bare patches and ice dams are very prominent problems for roofs in winter. Both are signs that there is not enough insulation in that part of your attic. It is going to make your energy bills go up. Additionally, it is going to contribute to roof damage and/or mold if left alone. 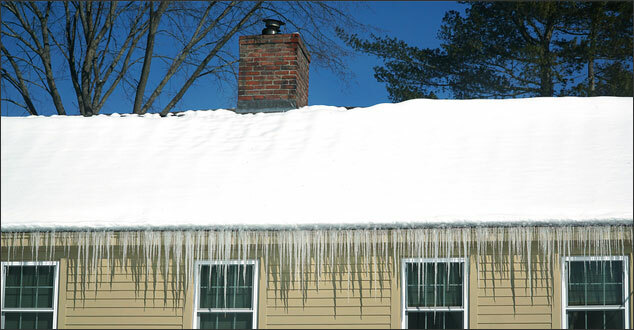 In addition, melted snow can contribute to an ice dam which can do major damage to your roof in one season. Ice dams are a build-up of ice and snow along the eaves, sometimes forming giant icicles. Can I Get a Roof Replacement in Winter? Of course, the easiest time – and the busiest season for roofers is spring and summer. However, having a roof repaired isn’t impossible in winter. If you are having an emergency, your local professional roofing company can help you determine your best course of action. And, of course, if you live in Southeast Michigan, call us! We would be honored to help.